Since I started blogging I have received many emails asking a range of questions including how it is that my patchwork piecing is so accurate and why all the blocks line up so well. Today I hope to answer some of those questions, although believe it or not, there are no big revelations here. I don't have any formal training in sewing or patchwork, and I am largely self-taught. I certainly don't profess to be an expert - I just do what works well for me, and have developed over time my own techniques for cutting and piecing. I encourage you to similarly work towards easy piecing methods for yourself. What follows here are definitely not the rules of patchwork, just snippets of information that may be of help to the beginner quilter, most of which you probably have heard before, and some of which states the obvious. I always use a rotary cutter and cutting mat for cutting fabrics. 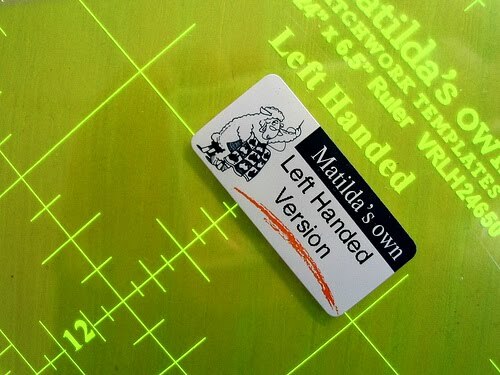 It is handy to have a range of large and small mats and rulers. My favorite ruler is the 6.5 inch x 24 inch ruler as it is great for cutting strips across the width of the fabric. My most often used cutting mat measures 24 inches x 36 inches. Big. My best cutting mat tip: keep it out of the sun or the car in warm weather as it will buckle! When cutting strips across the width of the fabric, align selvedges, smooth out, and straighten the raw edge. With the use of a long ruler you will not need to fold the fabric again. Align the trimmed end with the markings on the ruler; keeping the ruler firmly in place, push the rotary cutter away from you. 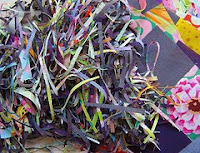 When cutting patches, first cut a strip the width of the square, then cut the strip into squares. If you are left-handed, invest in a left-handed ruler. Numbers read from left to right and which makes cutting without mistake much easier. 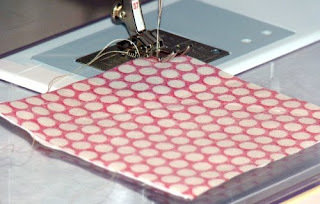 Cut fabric squares/rectangles on grain either lengthwise or cross wise to minimize stretching during cutting and sewing. Accurate cutting is essential, and whether you use the ruler so as to cut on the line or alongside the line, be consistent. Be as accurate as you can as tiny fractions of difference will come to haunt you when machine piecing. Replace the rotary blade regularly. Use a neutral color thread. I prefer to use a light grey, beige, white, or off-white color thread. I always use cotton thread, either Gutermann or Aurifil Mako 40/2 thread without preference for either. Use a 1/4 inch seam allowance. This is a universal quilting standard when using cotton quilting fabrics. It is sufficiently wide enough that your seams will not pull apart, but not so much that they will be bulky. I recommend the use of a 1/4 inch presser foot. This presser foot will allow you to run the edge of the foot along the edge of the fabric to achieve the 1/4 inch distance, or it may have a bar along the side to run along the fabric edge. If you do not have a 1/4 inch presser foot, some sewing machines will allow you to move your needle to different positions. Sew and then measure to get it right. A scant seam allowance is ideal as some of the fabric is "held up" in the fold or by the thread. For patchwork piecing I use a stitch length of 1.8 to 2.0 mm. I don't pin. Gasp! I only use pins for securing quilt binding to the back of the quilt and unfortunately to block my knitting. This means a lot of my pins are rather bent. When piecing I align the patches together from edge to edge, right sides facing and sew. No pinning. Never have. I guess that makes me from the "hold and sew" school - breaking all rules! I press seams to one side - which side depends on what other seams are required to be matched up, and also take into consideration that I would prefer to iron to the darker side. To match seams I press opposing seam allowances in opposite directions (at times this means I press seams to the lighter side). I then take the two pieces in hand right sides together, match or "lock" the seams by butting together. Pinch together with index finger and thumb. You will soon get a feel for how the seams lock together and how it feels when they are correctly abutted. This gets easier with time and practice. Again I don't pin. I do not back stitch at the beginning and end of each patch as the stitches will be secured by crossing seam lines when joining the pieces together. Change your needle regularly - I try to do so every time I start quilting a new quilt. 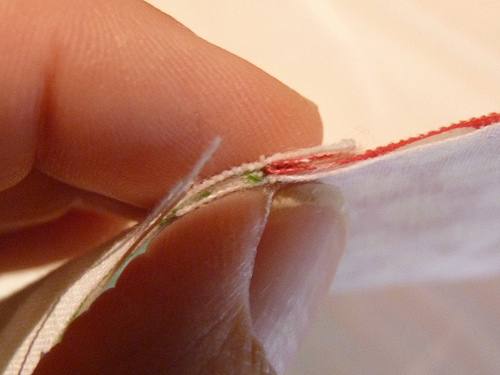 Blunt or damaged needles can tear fabric, cause skipped stitches or snap! I use Universal Point needles for both piecing and quilting either an 11/75 or 12/80. I do at times make oversize blocks and trim them back to correct size for accuracy, particularly for Half Square Triangles, but I enjoy that part of the process too. My quilts are not perfect, and I would hope you focus on the journey rather than on the end result. Try not to get caught up with perfection and the details, but enjoy playing with fabric and color, sewing, quilting and just being creative. Try to find your own rhythm and sewing techniques without fear of breaking the rules. Thanks for the great post on your quilting tips although I do everything you do except I do pin when butting seams together. A great post for those beginner sewers out there! It's always a good thing to review the basics. Great post. I pin a lot, and press seams open, but again, that's just personal preference, not a rule. 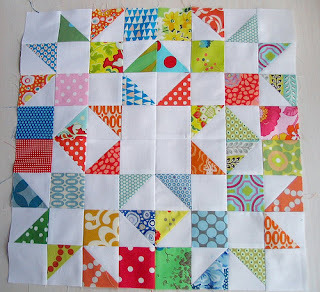 And that block, with all the bright colors and white--fabulous! I'm so glad I'm not the only one with lots of bent pins. I keep thinking I should throw them out. I'm amazed how well your seams line up without pinning. I pin everything to death!!! Thanks so much for this - I am still new to patchwork and quilting so this is really useful for me. I don't pin either! My piecing is not nearly as good as yours, and the ladies in my quilt group keep getting on me to pin. But like you said, I would rather it be about the journey then about perfection. Thank you for this post! Hi Rita, I've discovered your blog via Karen's (who has quilted several pieces for me). I have really enjoyed looking at all of your absolutely beautiful work. What clever sisters you are! Thanks too for all those tips on accurate piecing! This is so wonderfully helpful! Thank you for sharing with us. I know you don't preach perfection, but when I saw your green quilt at Kate's place today, I know you somehow manage to achieve it!!! thanks for the tips Rita - I would never have known you didn't pin as your corners all match up and your quilts look so perfect! 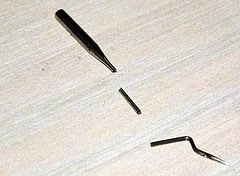 wow, I can`t believe you don`t use pins. that is a revelation to me. I will have to try it, although I`m nervous. as far as the journey being important, I agree, but let`s face it accurate piecing needs to be part of the process. If I make something with crocked edges, I struggle all the way to the end. Thank you so much for taking the time to explain this. I'm a beginner and have learned (or NOT learned) everything from quilting sites and blogs. I'm really enjoying quilting but sometimes get discouraged because I get in over my head. Seeing this today was just what I needed to get me focused on the basics again. All good pointers and advise. That broken machine needle looks scary...hope it didn't mess up your machine when that happened. Great tips and I too am stunned that you don't use pins (I hate pins by the way)! i am so happy to read that you don't pin! when i learned to quilt (and sew) last year i was taught to pin, but have hated it from day one and always felt that everything looked better those times i just winged it and didn't pin. i have always wondered if it's "okay" not to pin, and i have at least some assurance now knowing that someone as talented as you doesn't do it. yay for liberation! thanks for the liberating post! :) As a self taught quilter and I often wonder if I am doing it "right". I don't back stitch, I don't pin unless there are A LOT of seams to match when joining a row and most of the time my points match pretty well.I do use the 1/4" foot; best thing ever! 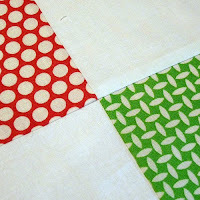 Thanks for taking the time to post about these 'basics' of patchwork and quilting. Wow, they make left handed rulers???? I need some of those. I'm a lefty and there is always a lot of flip flopping, reorienting, and triple checking to make sure I'm measuring and cutting correctly. I bet a left handed ruler will make the process flow much more naturally. Thanks for sharing!! I too often wondered how you achieve such beautiful work. As there really weren't any new revelations in your explanations, I must assume that you are just a natural. I'm wondering though what kind of iron do you use; steam or no steam. Your blocks always look so crisp and sit so flat? "Try to find your own rhythm and sewing techniques without fear of breaking the rules"
Thank you for sharing, Rita! Thank you so much for sharing your tips. I think your quilts are really beautiful and I hope that i can make quilts as beautiful as yours. I am loving your blog. I agree about enjoying the process and not letting the pursuit of perfection ruin our day. But sometimes quality is part of the fun too. Your quilts are awesome. Thanks for this great post Rita. If if I've sewn for a long time, I can still learn new things or be reminded of things I've forgotten!! These tips are fabulous! I never thought about the lefties before. Thanks so much for this, I'll be linking. Thanks for the great information! Your pics and instructions are nice - makes it easy to understand your methods. Keep up the wonderful sewing. that is a terrific tutorial, very well written and aimed at all levels really - some very good reminders!! I never pin either, and very rarely do I unpick. Thanks for the info, I am off to check my stitch length! No pins, I can relate to that when I am chain pieceing, however I find they make a big difference when i am sewing rows together. A friend/patchwork teacher just introduced me to the Clover forked pins, which pins both sides of a butted seam. This has helped my seams matching when I am sewing rows of pieced units. Although I must say that paying more attention to my cutting AND NOT using two different brand rulers (cut strips in 24" and squares from 12") when cutting has helped big time. All because the thickness of the lines on the ruler were different, across a whole quilt it adds up! Thanks for sharing, happy quilting, Sue SA. Thanks for the posting! It is great to see how others work, be it the same of different. I just read through your binding tutorial and can't wait to zig zab my binding prior to sewing on to see if that helps me with puckers. oh rita that is so helpful to little old beginner me! thank you so much for sharing! nice to see what I'm doing right and what I need to learn to get better! Lots of great tips for a beginner like me, thank you! What pattern did you use for this block? Thanks so much for all the tips! I bookmarked this page and came back to it today when I pieced my rows together. Thank you so much for taking the time to write this. My quilt top is the best I have ever made thanks to you! Woohoo! Wonderful tips, great reading for someone like me who has owned quilting books for more than ten years, has a building stash and is teetering on the edge of making my first quilt. I was just about to sit down to piece my first quilt and wanted to know what stitch length to use - thank you for having the answer and for all the other handy tips! I tend not to pin small pieces either so I'll see how I do without them.